While still forging his path in the hockey world’s landscape, Robert Thomas’ legacy will forever be immortalized in Aurora sports culture. 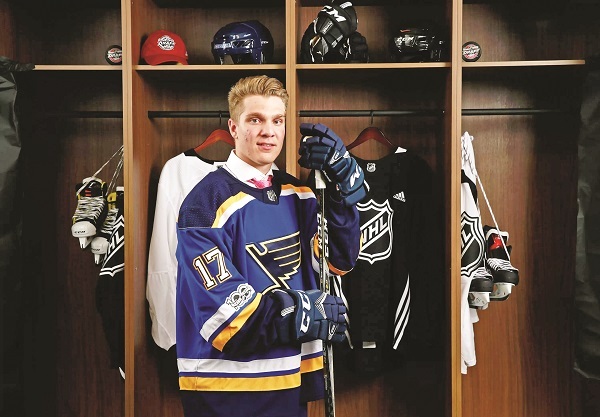 The 19-year old St. Louis Blues prospect was honoured Saturday at the Mayor’s Breakfast of Champions as the 2018 Athlete of the Year, sponsored by Sport Aurora. A staple in the York-Simcoe Express AAA minor system from a young age, the Canadian hockey world first caught a glimpse of Thomas on the gold medal winning Team Canada at the 2018 IIHF Under-20 World Championship in January. The 2017 first-round draft pick of the St. Louis Blues capped off an incredible Ontario Hockey League season as the leading scorer of the Hamilton Bulldogs, leading to hearing his name called as the league’s Most Valuable Player following the Bulldogs championship title in May of this year. Thomas was leading the OHL’s London Knights in scoring when he was traded to the Bulldogs in a blockbuster in January, setting up Hamilton for their successful run. Though the Bulldogs were forced to give up a promising prospect, four second round draft picks, and a third round pick to acquire the prized centreman, the Aurora native led his team the remainder of the season in putting up four goals and 25 assists in 22 games with his new club. He spent the better part of three OHL seasons with the Knights, catching the eye of scouts after a successful stint in the York-Simcoe Express minor system and a cup of coffee with the St. Andrew’s Saints varsity squad. Thomas is the third athlete to receive the Athlete of the Year honour, first handed out in 2016 to fellow hockey player Cameron Morrison, an ex-Aurora Tiger and current Colorado Avalanche prospect. Last year’s honour went to Carmen Whelan, a celebrated Canadian gymnast and graduate of Dr. G.W. Williams Secondary School in Aurora. Sponsored by the Mayor’s Office and now in its seventh year, the Breakfast of Champions annually brings together Aurora’s winning teams, individuals, coaches, and managers under one roof to celebrate Provincial championships or better within their respective sports. This year’s crop of champions included eleven teams and more than 120 athletes and coaches. Ex-NHLer and Junior A Aurora Tigers owner Jim Thomson once again played emcee, while Aurora Sports Hall of Fame member Dan Thompson was a keynote speaker. Thompson was Canada’s national swim team captain from 1978-81, while also named captain of the Canadian Olympic team in 1980.